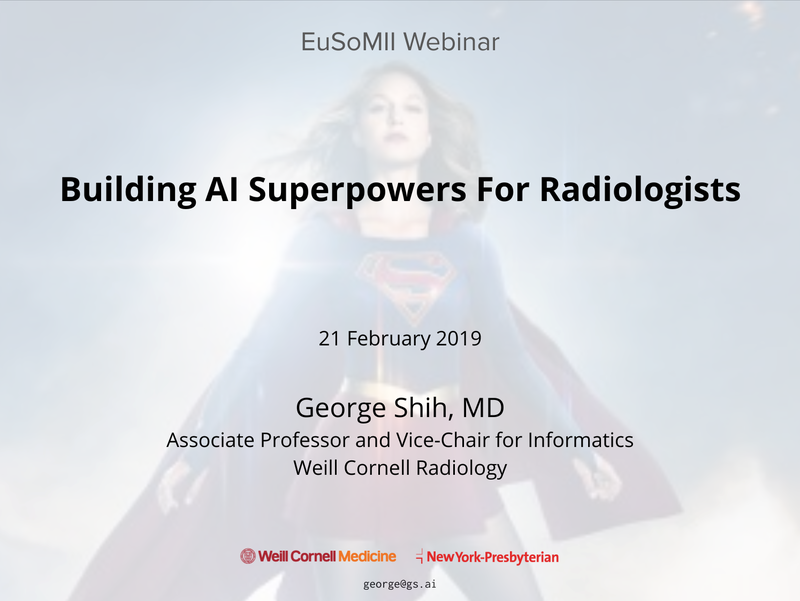 THE TOPIC of webinar will be ‘Building AI Superpowers for Radiologists’ and George Shihwill be giving an intro to AI, as well as the important steps for creating AI algorithms, including a lot of discussion around annotations. He will also describe two large-scale annotation projects he has worked on with the RSNA and SIIM ML Committees. Dr. GEORGE SHIH is an abdominal radiologist at Weill Cornell Medical Center. He is Associate Professor and Vice-Chairman of Informatics in the Department of Radiology, with an interest in machine learning. His background is in Computer Science and Electrical Engineering. Some of his current society and publication positions include: RSNA Machine Learning Steering Committee RSNA Machine Learning Data Committee SIIM Machine Learning Committee (Co-chair) RSNA Scientific Program Committee (Informatics Chair) Society of Abdominal Radiology AI Committee (Co-Chair) Journal of Digital Imaging (Editorial Board) Radiology Artificial Intellligence Journal (Associate Editor). He is also co-founder of MD.ai (https://www.md.ai), which is an AI startup building a cloud platform for doctors, researchers, and engineers to annotate, create, validate, and deploy medical AI.